The family-friendly Novotel Troyes Aéroport with swimming pool offers great deals for cheap but comfortable stays while saving when shopping at McArthur Glen Outlet Mall and other factory stores in Champagne. The Novotel Troyes Aéroport is a comfortable, family-friendly hotel with swimming pool, quietly located in the northwestern outskirts of Troyes in the Aube en Champagne region in France. 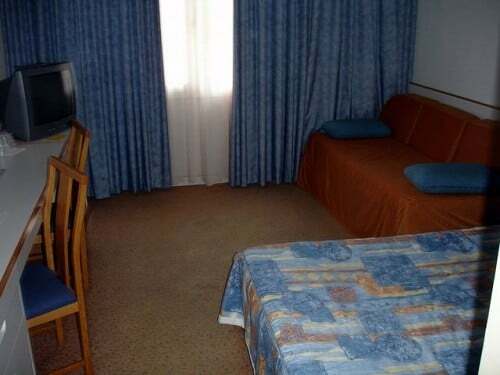 The Novotel Troyes Airport hotel offer great deals and very cheap stays for advance reservations. The family-friendly rooms have a double bed and a sleeper couch to sleep up to four per room in comfort – two children under 16 stay for free. The Novotel Troyes Aéroport is a great deal for families, especially over weekends when business clientele stays away and prices drop. Do use major internet hotel reservation services to see what prices are available on Troyes hotels but booking directly with the Novotel will usually give the best price, special offers especially for early reservations, and the best cancellation options. The Novotel Troyes Aéroport is a typical Novotel and although still using the older decoration, furnishings are still in very good condition. Rooms feature a double bed as well as a sleeper couch that can fold out to two single beds. 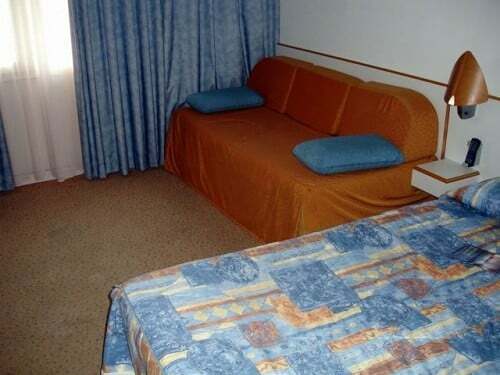 The room decoration is a bit dated with orange and a grayish blue the dominant colors. Thick curtains allow for darkness even during daylights hours. A room for two adults and two children can be below €70 per night and seldom goes as high as €100. Early and fixed reservations give the best deals. Prices are usually lower on weekends, which is great for leisure travelers. Like most Novotel hotels, bedrooms in the Novotel Troyes Airport hotel also have the toilet in a separate room but unfortunately without its own washing basin. The bathroom features a bath and shower. Lightening in the bathroom is very good – two light switches allow for switching on only half the lights, which is soft on the eyes in the middle of the night. Toiletries and towels are sufficient for four persons. The Novotel Troyes Aéroport is a low, two-storey hotel building. It may be a bit sterile and devoid of character but no-one reserves a room in a Novotel when looking for character. Accor Hotels’ Novotel brand hotels offer reasonable comfort at a great price. Business travelers appreciate the Novotel as do families with small children as most Novotel hotels can sleep four per room and children under 16 years old always share their parents’ room for free. Breakfast for children is free when eating with paying parents. The Novotel Troyes Airport has plenty of free parking available. Hotel side doors open allowing easy transportation of luggage from car to room. The parking area is not locked at night or even fenced-off. However, given the type of luxury cars in the parking lot – numerous BMWs, Audis, and larger Renaults and Peugeots – that does not seem to be much of an issue. Like most Novotel hotels, the Novotel Troyes Aéroport hotel is not in the town center but rather at the outskirts of Troyes around 5 km from the old town. An own car is probably essential as public transportation options here seem a bit restricted. The Aéroport in Novotel Troyes Aéroport is slightly misleading. 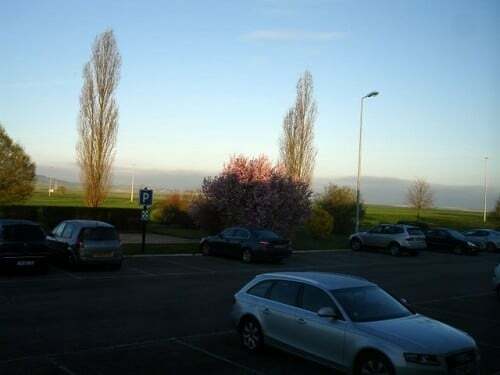 The Novotel is directly at said airport but the Troyes-Barberey Airport is more of an airfield – aircraft movements are very limited and noise coming from the airport very rare. The location of the Novotel Troyes Aéroport is very convenient for drivers. Access is easy by car from the Autoroute A5 highway (exit 20) from Paris and A26 (exit 22) from Reims and Calais. 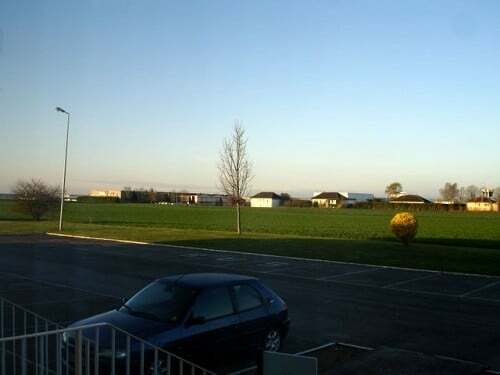 It is an easy drive to the historic old town of Troyes while the hotel is also very conveniently located for visiting the large McArthur Glen Outlet Mall with factory shops. See what TripAdvisor users have to say about the Novotel Troyes Airport Hotel.